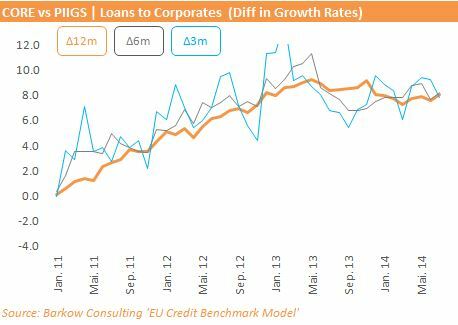 We have just taken a look at Eurozone corporate loan trends for August using our proprietary EU Credit Benchmark Model®. 1) Growth Trends: We look at the development of various growth rates (12m, 6m, 3m) for Eurozone corporate loans, rather than just focusing on yoy-deltas, which are at the center point of ECB disclosure. In doing so, we can identify turning points in the credit cycle earlier. 2) Growth Gaps: We look at the corporate credit growth difference of selected Eurozone regions or country aggregates, of which the most important one is the Core/PIIGS differential. – Eurozone corporate loan growth stood at -2.2% yoy in August, slightly better than July, which was revised down to -2.4% yoy. – Short term Eurozone growth rates (6m, 3m) deteriorated for the second month in a row and currently do not indicate further improvement of yoy growth. => BIG BERTHA STILL NOT FIRING!